NEW YORK (CNN) -- The numbers were good for "Knowing." 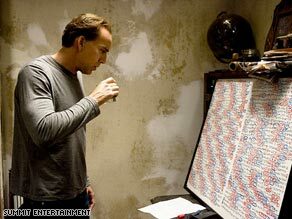 In "Knowing," a physics professor (Nicolas Cage) ponders patterns in a list of numbers. The film, about a physics professor who sees clues for disastrous events in a time capsule's list of digits, overcame some pretty long odds at the box office -- going against the Paul Rudd-Jason Segel comedy "I Love You, Man," the Julia Roberts-Clive Owen romantic thriller "Duplicity" and some fairly scathing reviews -- to emerge as the weekend's No. 1 film. Though star Nicolas Cage wouldn't have predicted the outcome, in an interview before the film's release, he did talk about the power of positive thinking. "I'm a huge believer of the human spirit," he told CNN. "I think people are amazing. I think what we have accomplished is incredible. ... If you think positive and you apply the guts and ingenuity that mankind has been doing forever, at least in our existence, I believe we get through anything." Cage's character, John Koestler, is a science professor whom Cage describes as "someone who is reawakening to his faith." He begins the film believing that everything is random, but as the film continues -- and he seeks to alert the world of a coming catastrophe -- "he believes there is cause and effect and perhaps even a divine mind," Cage said. The film begins in 1959, with students burying items in a time capsule at an elementary school. One of the children, however, creates an image of seemingly random numbers. Fifty years later, when the capsule is opened, Koestler's son receives the page of numbers, and his father realizes that they correspond to major disasters of the past half-century. Koestler determines that three events have yet to occur and sets out to meet the clairvoyant child's now grown daughter. The final event threatens life on Earth itself, and the group begins a race against time, with unusual consequences. "It's increasingly hard to believe that Cage won an Oscar in 1996 (for 'Leaving Las Vegas')," wrote USA Today's Claudia Puig in a 1½-star review. "In the past decade, he has made some awful choices, and his range has seemed to grow more limited." "It's so inept that you may wish you were watching an M. Night Shyamalan version of the very same premise," wrote Entertainment Weekly's Owen Gleiberman, referring to the director whose last two films, "Lady in the Water" and "The Happening," were two of the most detested films of recent years. But the film's apocalyptic theme obviously strikes a chord, something director Alex Proyas ("Dark City") saw early on. Proyas told CNN in a pre-release interview that "you can read [the film] as biblical if you choose to," but he prefers to see it as "spiritual." "I try to leave it very open-ended," he said. "I try to think of it as more a spiritual place than a biblical one." Cage's character, he said, is on a spiritual quest in the midst of what could be global destruction. Rose Byrne, who plays the clairvoyant child's daughter, Diana, called the film "kind of a theological discussion." "That's always an exciting topic," she said. "It's bridging the gap between science and spirituality. That always makes things thought-provoking, and I like that with any piece of art." "I think it's a common thing in life," she said of end-of-the-world fears, referencing one of the latest making the rounds -- the Mayan calendar's Long Count end in 2012 -- in making her point. Proyas observes that given such worries, the film can be a wake-up call for such concerns as global climate change. "There is a symbolic aspect to what is happening and what the story is about, and to get people to pay attention to what could happen," he said. But, he adds, it's also just a movie. "I believe in the entertainment value of movies -- very much so," he said. "I ... want to make it good for the audience. I really want people to be there and experience something powerful and resident, both in terms of ideas and emotions ... and also with this film trying to do something different. It's a challenging film, and it takes some unexpected turns."